A groundbreaking and unprecedented retrospective of seminal Italian-born American artist and architect Paolo Soleri is now on view at the Scottsdale Museum of Contemporary Art (SMoCA). Organized by SMoCA Curator of Contemporary Art Claire C. Carter, Paolo Soleri: The City Is Nature focuses on drawings, sculptures and models that Soleri produced during the richest years of his artistic evolution from 1947 until the mid-1970s. 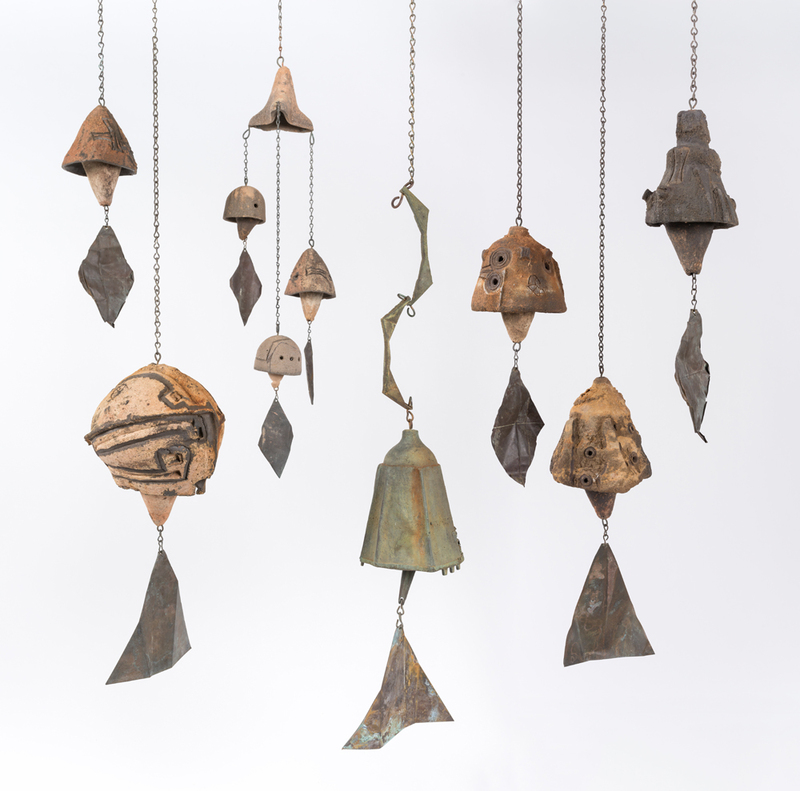 The selected works represent Soleri’s most creative moments when he was making his artwork and constructing his home-studio, primarily with his own hands. The exhibition brings together elements from his built and unbuilt residences, bridges, dams, cities and transportation systems. In addition to original drawings, models and sketchbooks, the exhibition surveys the artist’s earliest ceramic and bronze artisan crafts, as well as fabric designs and silkscreens. It also investigates the architect’s personal engagement with the art and architecture of his time; the widespread recognition of his work by museums, scholars and curators; his relationship with Frank Lloyd Wright; and his influence on the American counterculture of the ‘60s and ‘70s. The exhibition is the first and only retrospective and monographic exhibition since Soleri’s death in 2013 in Paradise Valley, Arizona and represents the largest collection of original drawings, fragile sketchbooks, architectural models, sculptures, prints and photographs presented in North America since 1971. It covers approximately 4,500 square feet with works gathered from the artist’s vast archives; The Museum of Modern Art (MoMA), New York; and private collections. Large scroll drawings — some more than 30 feet long — will be presented for the first time since their conservation in 2005. Soleri’s pioneering idea, “arcology,” or the fusion of architecture and ecology, proved prescient in its ties to current issues about sustainable cities, suburban sprawl, climate change, renewable energy and water shortages. His designs address low-density urban and suburban sprawl and focus on the city’s relationship to the natural world and environmental accountability. In his prolific drawings, Soleri imagined vibrant urban spaces created by high-density urban living, respect for natural resources and a commercial sector based upon creativity. The proposed high-rise buildings provide square footage on a smaller footprint. Pedestrian-friendly parks and gardens link the elements of a vibrant city center — private residences, stores, schools, markets, churches, hospitals, libraries, theaters and museums. Paolo Soleri: The City Is Nature is SMoCA’s third and final exhibition exploring the trajectory of Soleri’s art, architecture and philosophy, initiated in 2010. The first was Bridges: Spanning the Ideas of Paolo Soleri (2011); the second was Paolo Soleri: Mesa City to Arcosanti (2013). Bridges focused on the architect’s designs for bridges, which he viewed as metaphors for the way humans connect to one another and the natural landscape, and coincided with the inauguration of Soleri’s final construction project, the Soleri Bridge and Plaza on the Scottsdale Waterfront. The Mesa City exhibition concentrated on Soleri’s urban designs, including Cosanti and Arcosanti — two residential communities he built in the Arizona desert. Cosanti is Soleri’s studio and former residence in Paradise Valley. The name Cosanti combines the Italian word “cosa,” or thing, and the Latin prefix “anti,” or against. “Anti‐thing,” or anti‐materialist, is a value the architect was committed to in his art, architecture and personal life. Arcosanti is Soleri’s largest experiment with urban design, located about 70 miles north of Phoenix in Mayer, Arizona. Construction at Cosanti began in 1955 and new construction ended in 1969 when Soleri and his apprentices redirected their attention to Arcosanti. Soleri initially conceived of Arcosanti as a residential community focused on environmental accountability and sustainability. His first designs and models depict a dense urban city with more than 5,000 residents living in massive apse‐shaped buildings rising high above a desert canyon. Building vertically would reduce the city’s spatial footprint and provide residents with immediate access to the beautiful natural landscape. 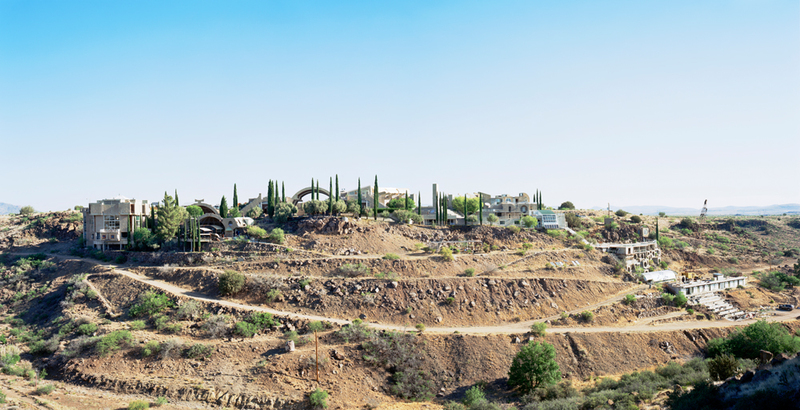 Arcosanti quickly became a nexus in American avant‐garde art, music and theater. During the latter half of the 20th century, Cosanti and Arcosanti were considered pilgrimage sites for the counter-culture, and were visited by celebrated artists and intellectuals, such as composer John Cage, feminist Betty Friedan, scientist Stephen Jay Gould, choreographer Anna Halprin, photographers Julius Shulman and Hans Namuth, and filmmakers Frances Ford Coppola and George Lucas. The majority of structures were completed by the early ‘80s. The number of residents peaked in the mid‐’70s when more than 150 people camped onsite. During the ‘80s economic crisis, financial resources, as well as popular interest in the site, waned. Today, Arcosanti includes a ceramics workshop and bronze foundry, community spaces, a performance stage, cafeteria, dormitories and private residences where about 40 permanent and semi‐permanent individuals live. Soleri, born in Turin, Italy, in 1919, initially was drawn to the United States by the desire to apprentice at Taliesin West with Wright, and he fell in love with the American Southwest, the desert landscape and the freedom isolation provided. Although Italian by birth, Soleri became a U.S. citizen and always identified as an American artist. He first drew national attention while apprenticing under Wright in 1948 and his artwork figured into the earliest integrations of art and architecture in American art museums. He was included in The Museum of Modern Art’s book, The Architecture of Bridges (1949), which was followed by three seminal contemporary architecture exhibitions at MoMA: Built in the USA: Post-War Architecture (1952), Visionary Architecture (1960) and Modern Architecture, U.S.A. (1965). 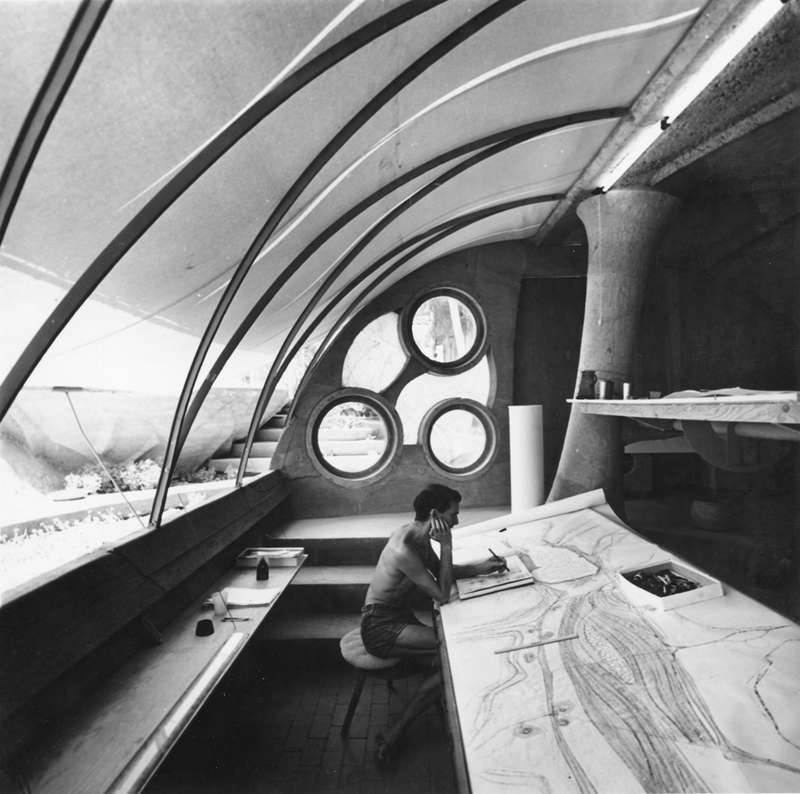 In the ‘50s and ’60s, Soleri was exhibited beside Le Corbusier, Buckminster Fuller, Louis Kahn, Charles and Ray Eames, and Wright. In 2000 Soleri received a Golden Lion for Lifetime Achievement at the Venice Biennale. He was awarded gold medals from the American Institute of Architects and the Union of International Architects, and received a Lifetime Achievement Award from the Cooper Hewitt Smithsonian Design Museum in 2006. Despite these accolades, until now the last major U.S. exhibition of Soleri’s work, The Architectural Visions of Paolo Soleri, was organized in 1969–1970 by the Corcoran Museum of Art and traveled to the Whitney Museum of American Art; the Museum of Contemporary Art, Chicago; and the Berkeley Art Museum; among others.